Something CRAZYYY happened on Instagram yesterday – ALL Linktree links were marked as SPAM and were temporarily broken. If you are using a Linktree link in your Instagram bio, this means you were effected and some people who tried to click on your bio link got a notification that the link was marked as SPAM! Linktree is a popular 3rd party app you can use to get around the “one link” rule on Instagram. 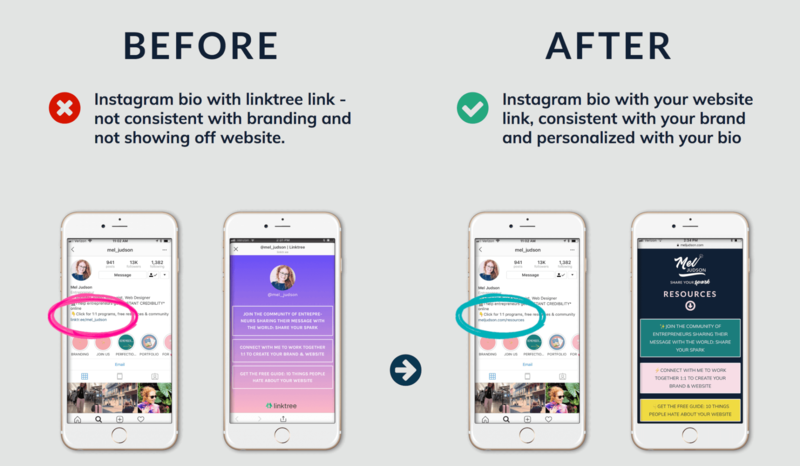 The app creates a Linktree branded landing page for you to add multiple links to, and then you add the Linktree branded link to your Instagram bio. It seems great in theory, but when it breaks like it did yesterday, it can have a hugely negative impact on your marketing. If you are service based online entrepreneur using Instagram to market your services, you only get one shot to connect with people when they click on your link. ❌SACRIFICES YOUR BRANDING: The free version only has a handful of color schemes that likely do not fit your branding so you are not creating a cohesive brand experience from the get-go. 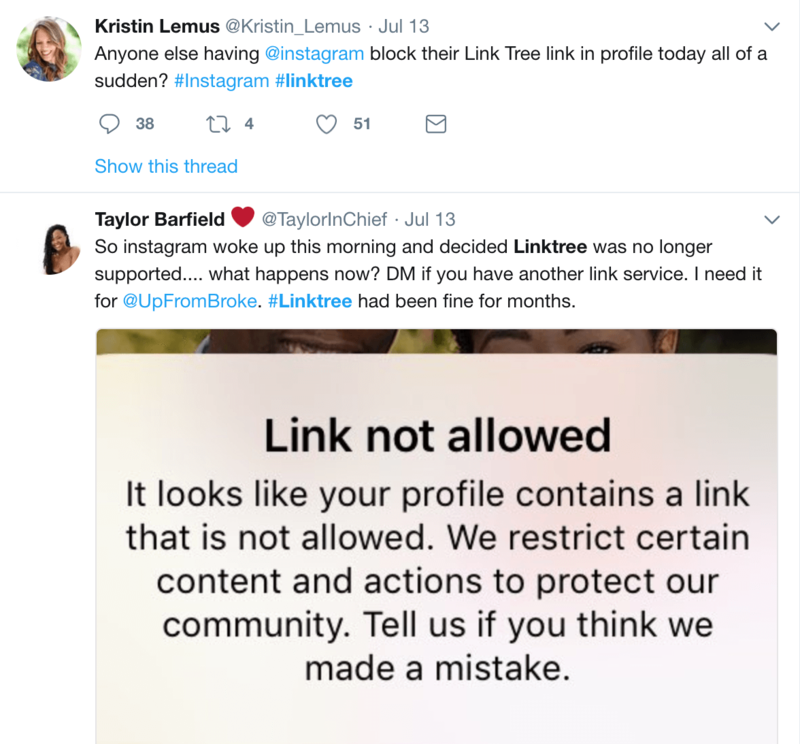 ❌NO GUARANTEE: Linktree links could be banned and/or marked as spam by Instagram at any time with no notice – leaving you with a broken link on your Instagram bio. This has happened before as recently as July, 2018 when Instagram temporarily recognized Linktree as against community standards. ❌NO PERSONALIZATION: Linktree doesn’t give you the option to add photos or a little bio at the bottom of your links for people to get to know you more. As a service based entrepreneur – you need your personality to shine from the first interaction. ❌COSTS MONEY: The pro version of linktree allows you to customize your color scheme and add a short description in addition to some other features – for a monthly fee. 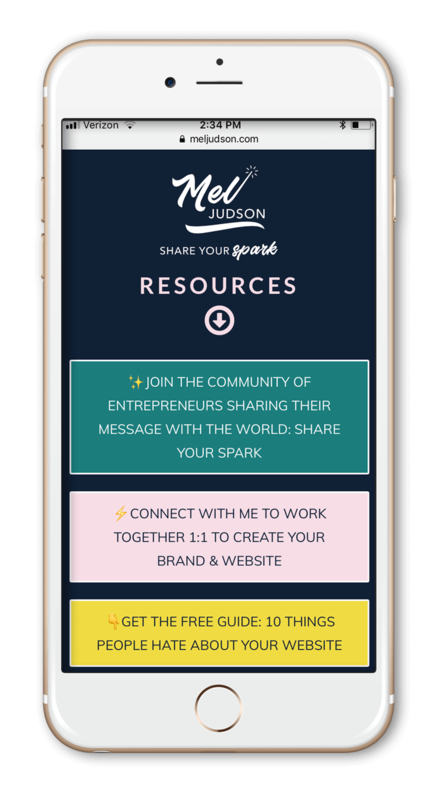 As an entrepreneur every penny counts and you could be doing the same thing for FREE on your own website. ❌LOWER PAGE RANKING (HURTS YOUR SEO): Every time a person clicks the link in your Instagram bio is an opportunity to boost your own website page ranking. By using linktree, you are giving away this ranking to them instead. Using a 3rd Party service like LinkTree for the 1 and only link you get on Instagram is a huge missed opportunity for marketing your business effectively. ✅CREATE a landing page hosted on your own website! This is a much more reliable and professional option for you that allows you to track conversions, setup Facebook Pixels for each link and retarget people who click. Even if you aren’t using linktree in your Insta bio and are instead using a simple link to your website of your most recent blog post, you are MISSING OUT on the opportunity to offer multiple ways to connect with your ideal client and show them how you can help them. Every online business needs this Instagram landing page. You can see already how much more on brand and professional this looks. It makes you stand out from the crowd and elevates your brand above everyone whose pages all look alike because they are using the same 3rd party app. You can add an other element of personalization by adding a mini-bio with your smiling face and an introduction for who you are and how you help people. Conclude this section with an invitation to connect with you using the links above and you will have crafted a premium, branded experience as someone’s first interaction with you. Pretty nifty, right? You can quickly and easily create your custom Instagram Landing Page just by creating a new page on your already existing website, add your links and mini-bio, optimize it for mobile, style it to match your brand and you are good to go! If you feel like you need some help creating that page, that is where I come in. ✨I have a service available where I will create your Instagram Landing Page for you. ✨You get a done-for-you custom Instagram Landing Page hosted on your own url that you can update any time you want. ✨If you’re a service based entrepreneur running your business online, you need to make sure you get this. You can’t afford to put all your eggs in the basket of a 3rd party service that could shut down or be marked as spam at any moment. All you have to do is click the link, complete your purchase and then you will be taken to a form to fill out all the info you want on the page. Then my team and I will jump in and create your custom landing page this week! Here’s the link to get your Instagram Landing Page. You can also see this in action by checking out my Instagram bio. No detail in your business is too small. It’s important to make sure you are taking full advantage of every marketing opportunity available to you and your Instagram Bio is no exception. Rooting for you today and every day.